Ex-speedway champion Jensen Ames (Statham) is a master of survival in a futuristic post-industrial wasteland. Framed and imprisoned for the gruesome murder of his wife, Ames is forced to face the country's most violent criminals in a brutal televised car race run by the prison warden. Welcome to Death Race. Special Features Create Your Own Race: Choose Multiple Camera Angles And Create Your Own Death Race! Then Share Your Race With You..
DEATH RACE: Ex-speedway champion Jensen Ames (Statham) is a master of survival in a futuristic post-industrial wasteland. Framed and imprisoned for the gruesome murder of his family, Ames is forced to face the country's most violent criminals in a brutal televised car race run by the prison warden. DEATH RACE 2: Bring you back into the adrenaline-pumping world of the most evil reality TV show on Earth - Death Race. Packed with monster.. The filmmakers of DEATH RACE and RESIDENT EVIL bring you back into the adrenaline-pumping world of the most evil reality TV show on Earth - Death Race. Packed with monster cars, machine guns and bone-crunching crashes, this explosive film brings together an all-star cast - including: Luke Goss (HELLBOY 2: THE GOLDEN ARMY), Sean Bean (THE LORD OF THE RINGS TRILOGY); Ving Rhames (PIRANHA 3D) and Danny Trejo (GRINDHOUSE) - for more high-oc..
Repentant convict Carl Lucas (Luke Goss) - aka Frankenstein - is a legendary driver in the brutal prison blood sport known as Death Race. Only one victory away from winning freedom, Lucas is plunged into his most vicious competition yet: the first-ever desert Death Race. Through South Africa's infernal Kalahari Desert, Lucas is pitted against ruthless adversaries and powerful forces at work behind the scenes to ensure his defeat. 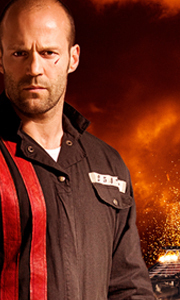 Also s..
Ex-speedway champion Jensen Ames (Statham) is a master of survival in a futuristic post-industrial wasteland. Framed and imprisoned for the gruesome murder of his wife, Ames is forced to face the country's most violent criminals in a brutal televised car race run by the prison warden. With monster cars, machine guns, and bone crunching crashes, Ames will destroy anything in his path to claim his prize of freedom. This Action packed expl..
Danny Trejo returns as the ruthless bookie, Goldberg, in the wildest, bloodiest, Death Race ever. After a failed attack on inmate and legendary driver, Frankenstein, Black Ops specialist Connor Gibson (Zach McGowan) infiltrates a super-maximum federal prison with one goal - enter the immoral and illegal Death Race and take Frankenstein down. Connor enlists the help of Baltimore Bob (Danny Glover) and Lists (Fred Koehler), and unexpected..